MAIN IDEA: Worship and trust Jesus who meets our every need. People are needy. We spend our day looking for ways to meet our needs. We have basic physical needs to fulfill such as food, water, sleep, and shelter. We have many needs that are not physical. We need to love someone, and we need someone to love us. Many young men join gangs, not because they have a desire for violence, but because they need to belong. When there is strife, conflict, and wars, we cry out for peace. When we have sadness, we seek joy. Laughter is good medicine. We desire to know that our life matters. We desire to know how we fit in and that we have purpose and meaning. Our need for love, joy, peace, and life go beyond our need for food and shelter. We often give up the comforts of life to obtain love and joy. Enjoying a loaf of bread with friends is better than a feast with our enemies. We’d gladly sleep on the ground if it means we can sleep in peace. We will live in poverty if it means we may be close to those who we love. During December, our focus as a church is missions. We are bringing in people who are joyfully committing their lives to the purpose of God’s mission. 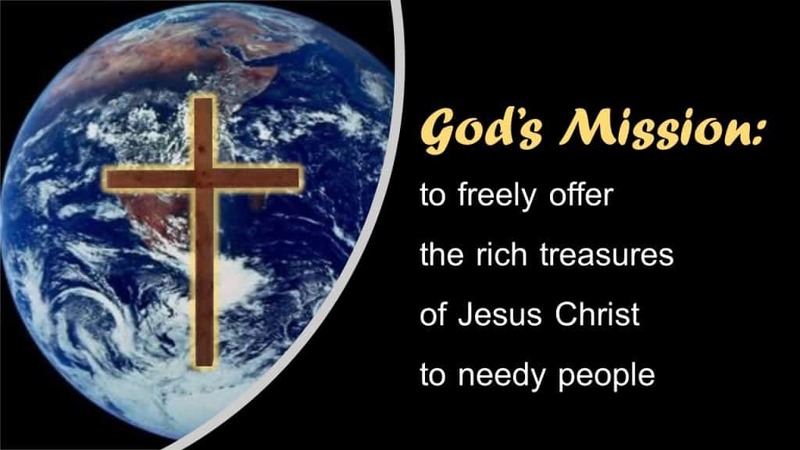 God’s Mission is to freely offer the rich treasures of Jesus Christ to needy people. God wants the world to know that He is the source of all of our needs. His Son is His mission. God sends His beloved Son to save us and let us know that all of our needs are met in Christ. We need not look any other place. We often look at our careers, family, education, and entertainment, to meet our deepest needs. These things are good, but they don’t provide eternal satisfaction. God wants us to know that Jesus will eternally fill our deepest needs and longings. God chooses two primary ways to accomplish His mission. The first way God chooses is His Holy Word. God’s Word is the truth. People are deceived and do not know the truth. God’s speaks to all the people of the earth to let them know about His Son, Jesus Christ. God’s word is the way for people to know that Jesus Christ is the Way, the Truth, and the Life. The second way God chooses to accomplish His mission is the church; the gathering of people who proclaim His truth. All across the world, God is establishing the church to herald the truth. A church without the Word of God is not accomplishing God’s mission. When a church does not faithfully proclaim the truth of God’s Word, the church is not working for God, but against God. A church which faithfully brings the Word of God to people is pleasing to God. The Word of God speaks about the church. After Jesus rises from the dead, we read how the Apostles endeavor to establish churches throughout the world so God’s word may be proclaimed. Today, this church, and other churches in the world are a testimony to God’s mission. The focus of the message this morning is to speak about what God says about the church and how the church meets our needs. The goal of this message is to give us a deeper understanding of how God is using His word and His church to accomplish His mission. We are to have a high view of the local church as a work of God on the earth. The Bible gives us five pictures of the church. Each picture is an illustration of how God is meeting our needs today, and for eternity, through the church. We may speak at great length on each of these five pictures. This morning, we are going to give an overview of each picture. We are encouraged to take each picture and study it in depth. Our first picture this morning is that the church is a holy Temple. This picture is found in many places in the Bible. The passage we are using today to help us see this picture is from Paul’s letter to the church in Ephesus. The Holy Temple God is building is God's household. The foundation Paul speaks about is the Word of God which is proclaimed by God’s people. Jesus Christ is the corner stone of the Holy Temple. A corner stone is a stone which all the other stones being placed use as a reference. The cornerstone is the most important stone. It is not the biggest or the prettiest, but it is the stone which aligns the rest of the stones. If a stone is placed that is not aligned, the stone must be reset so that it is straight. All the stones which God is placing must be in line with Jesus. As we go through each picture, we will see four truths we need to know and apply in our lives. 1) We will see the need that Jesus meets, 2) the role Jesus plays in the church, 3) the role we are to fulfill, and 3) what we must do to respond. The first truth is that Jesus gives us alignment. God’s mission is to meet our need of being right with Him. Jesus is holy and righteous. Without Jesus, we are not in alignment with God. When we live unholy, disobedient, and unrighteous lives, God does not place us into His temple. Disobedient people are enemies with God. The role Jesus fulfills in the picture of the Holy Temple is that of the corner stone. Jesus lives a perfect life of obedience and righteousness. The role we are to fulfill is that as we are to place ourselves as living stones in God’s household. We do this by looking to Jesus as our example. Therefore, we are to be holy. Without Jesus as our cornerstone, we are building a house on sand. When the storms of life come, our building is washed away because the foundation is sand. Without Jesus as our cornerstone, we do not live lives that are pleasing to God. God’s mission is to meet our need for holiness so that we may be in fellowship with God. The only way to meet the need for holiness is by putting our faith in Jesus as our Lord and Savior. We are to align our lives with Jesus. The second picture of the church the Bible gives us that of a body. The Word of God gives us many pictures of the church as being a body. We find descriptions of the body in Paul’s letter to the Ephesians and the Colossians. The Apostle Paul’s letter to the Corinthians describes the body in great detail. The purpose of Paul’s writing is to tell the church that there is only one body, but the body has many members. The Apostle Paul tells us that each member of the body is important. Allow me to paraphrase what Paul says about the members of the body. What if the foot says, “Because I am not a hand, I am not a part of the body." Is it right for the foot to say that? Of course not. Because the foot is not a hand, it does not mean that it is not part of the body. The same goes for the ear. The ear may not say, "Because I am not an eye, I am not a part of the body." At the same time, the eye cannot say to the hand, “I do not need you.” Neither can the eye say to the head or the feet, "I do not need you.” The point is that God places each person in the body and every part of the body is important. The first truth we learn is that Jesus gives us purpose. As members of the body in the church, each one of us has a purpose. As people, we desire to know that life has meaning and purpose. Jesus fulfills that need. We have a purpose in the church. The second truth we need to understand is that Jesus is the head of the body (Eph. 1:22-23, Col. 1:18). That means Jesus is the decision maker. Jesus is the head of the church. He tells the church where to go. Jesus speaks, hears, and sees for the church. A church where Jesus is not the head is not a church. The people of the church are members. Every member of the body is important. We may not say, I do not need the body of Christ. People who think they may live as a Christian but not belong to a church are disobeying God. The weak members of the body need strong members. At the same time, just as importantly, strong members of the body need the weak members. As soon as the strong members think they may get by without the weak members, they are in deep trouble. In God’s body, there is no such thing as a weak, unneeded member. Every member is needed. Every member has a purpose. When we think we don’t have a purpose, we are calling God, the One who places us in the body, a liar. God gifts each person of the body. It is up to us to help one another fulfill their purpose in the church. And, because each of us is needed, we need to serve. We have a purpose to fulfill, and that is to serve one another. Ultimately, as a body, we need to align ourselves as holy members and fulfill God’s mission by proclaiming to the world how Jesus fulfills our need. Jesus gives us purpose. The third picture in the Bible portraying the church is that of a flock. Often, especially in the Old Testament, God’s people are referred to as sheep. The Apostle John writes of how Jesus describes Himself as the Good Shepherd. Jesus tells us that if one of His sheep is lost, He will leave the 99 and find the one that is missing. We need for someone to care for us, and Jesus promises to give us that care. Most people are familiar with the 23rd Psalm. This psalm is a beautiful picture of how Jesus cares for us. Jesus is the Good Shepherd. We are His sheep. Therefore, we need to trust Jesus. We need to trust Him that He will guide us to the green pastures and the still waters. We need to trust Him that even though we are walking through the valley of the shadow of death, He will protect us. We need to trust Jesus when He says we will dwell in the house of the Lord forever. Being a Christian is not easy. The world tempts us to leave our Shepherd. The world wants us to think that the grass is greener on the other side of the fence. We need to trust that Jesus knows what is best for us. Think of the life of the Apostle Paul. Life is not easy, but difficult for him. He suffers from being tortured and persecuted because of the gospel. But, Paul trusts Jesus. He knows that Jesus cares for Him and ultimately will bring him to dwell in the house of the Lord. Our Shepherd is good. Jesus stands between our enemies and us. He lays down His life for us. We know this because He died for on the cross to secure everything we need. He gives us salvation when we put our faith in Him. Therefore, trust the Good Shepherd. The fourth picture the Bible gives of the church’s relationship to the Jesus is that of a plant. This picture comes from the words of Jesus in John’s Gospel (John 15:4-5). Jesus tells us that He is the vine and we are the branches. The vine is the source of nutrients. If the branch is broken off of the vine, the branch will wither and die. So it is with our relationship with Jesus. If we break off our relationship with Him, we will die. At the same time, Jesus says if we abide in Him, we will bear much fruit. The truth we learn from this illustration is that Jesus gives us life. It is one thing to exist, and it is altogether another thing to have life in abundance. The life Jesus gives is a life of maturity. Jesus doesn’t want us to live a life of barrenness. He doesn’t want us to have a life that is empty and void. He wants to fill our life with fruit. Mature plants bear fruit. To abide in Jesus is to abide in His commandments. Jesus says that branches that do not abide in Him are branches that do not obey His commandments. Jesus commandment is simple. He commands that we love God and love one another. The fruit we bear is the fruit of the Spirit which is love, joy, peace, patience, kindness, goodness, faithfulness, gentleness, self-control (Gal. 5:22-23). The other fruit we bear is the fruit of the gospel. The Spirit-filled Christian joyfully tells others about salvation in Jesus. They participate in God’s mission. Because Jesus gives us life, let’s bear fruit. The fifth picture of the church is the most beautiful of all. It is a picture of a union between a husband and a wife. There are many examples in the Old and New Testament of the union between Jesus, the Bridegroom and the church, His bride. The Song of Solomon is a beautiful illustration of the union between Jesus and the church. In the book of Ephesians, the Apostle Paul begins telling how a husband and wife should relate to each other to be pleasing to God. Paul then tells us our marriage on earth is meant to be a picture of a future marriage of Jesus and His bride, the church (Eph. 5:32). Jesus loves His bride the church. He gives His life for the church. This is why we are to see the church as being very important. Jesus is making His bride ready for her wedding day. Jesus will present to Himself a holy and perfect bride. Of all the pictures, this picture offers the most hope for the future. Today, we are already the body of Christ. We are branches bearing fruit. We are sheep in the pasture, and we are living stones in the household of God. Our future union with Christ is our hope. The Bible ends by giving us a picture of the great wedding day. At the end of time, Jesus will come to fetch His bride. That day is the Second Coming of our Lord. We will meet Him in the air, and we will live with Him forever. The Apostle John gives us glimpses of that day in the book of Revelation. An angel speaks to John and says, “Come here, I will show you the bride, the wife of the Lamb.” The angel shows John the holy city, the new Jerusalem. It is composed of all the people of the church (Rev. 21). The book of Revelation says that on that day we will feast at a great marriage supper. It will be a feast celebrating our being joined together in union with Jesus in an intimate bond which will never be broken. Unfortunately, the sin of mankind cheapens intimacy and the beauty of marriage. Because of sin, it is difficult for us to imagine a perfect marriage. But, God is good. Our marriage in heaven with Jesus, the Son of God, will be the most fulfilling and satisfying relationship we can imagine. It is a marriage without flaw. Jesus is making us ready by cleansing us, so we are holy and blameless. He is making us perfect so we may enjoy His perfection. What we are to do today is worship Jesus who loves us and gives His life for us. Worship is more than singing songs of praise. Worship is to have deep devotion and adoration. Worship is living a life believing that Jesus is the most valuable treasure in the universe. Worship Jesus who gives His life for our joy and to meet all of our needs. There are two things that we need to notice about these pictures of the church. The first thing we need to notice is that there are no individuals. It is not Jesus and one stone or Jesus and one member of the body. The church is always a gathering of people. Christianity is not an individual endeavor, but a collective faith. We may not live the Christian life outside of the local church. We need one another. The second thing to note is the centrality of Jesus in every illustration. He is the most important stone, the head of the body, the Shepherd, the life-giving vine, and the Bridegroom who prepares the bride. He is the One who sheds His blood and lays down His life. He is the One who sheds is the giver of life. Jesus is the glory of the church. As we celebrate missions, let’ remember that the ultimate goal of missions is the accomplishment of God’s Mission. God’s mission is to freely offer the rich treasures of Jesus Christ to needy people. We live in a world filled with needy people who are looking for answers. Jesus is the answer. The gospel is good news. Jesus promises to meet our every need. He offers peace and rest. He gives our lives purpose and meaning. He protects us from our enemies and gives us safety and protection. Only Jesus offers forgiveness of sin and everlasting life. If you know Jesus, rejoice. Know that He is meeting your needs. If you don’t know Jesus, today is the day of salvation. God is offering His Son as a treasure for you to receive and enjoy.